Bagel came to Destiny for Dogs when her owners could not handle her having accidents in the house. She was surrendered to Destiny for Dogs and she was taken to the vet and had emergency surgery and literally more than 50 bladder stones were removed which means Bagel was in pain for quite some time. Deidre adopted Bagel and Bagel was able to live a very happy life. We are sad to say that Bagel has crossed over the Rainbow Bridge and she will be in our hearts furever. Deidre says that Bagel brought so much joy to her life and she was so grateful for her short time with her. 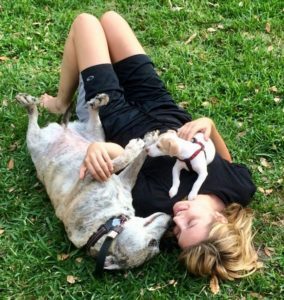 She wishes more people knew just how much happiness a senior adoption dog can bring to their lives. She misses her every day and feels so very lucky that Destiny for Dogs brought her into her life.